This is a really lovely way to cook fish and it adds so much flavour, a nice simple recipe to impress your mates. Each serving provides 530kcal, 35g protein, 43g carbohydrate (of which 3g sugars), 23g fat (of which 4.5g saturates), 2g fibre and 0.3g salt. Preheat the oven to 200C/180C Fan/Gas 6. Halve the courgette lenghtways and cut into thin slices. Halve the cherry tomatoes. Lay out a large sheet of foil, twice the size of the fish. Arrange the vegetables in an even layer on one side of the foil and season with salt and pepper. Lay the salmon on top and sprinkle over the mixed herbs. Grate some of the lemon zest over the salmon, and then squeeze the juice, being careful to discard any pips. Fold the foil over the fish then fold the edges of the foil inwards to make a neat parcel. Before the final edge is sealed, spoon in the vegetable stock, and then close the final edge. Lay on a baking tray then bake for 20 minutes. Meanwhile, add the rice to a a large pan with 200ml/7fl oz water and cover. Bring to the boil, then lower the heat and cook for 10-15 minutes until the water is absorbed. Use a fork to fluff up the rice. Take the salmon parcel out of the oven and carefully cut open as the steam will be very hot. 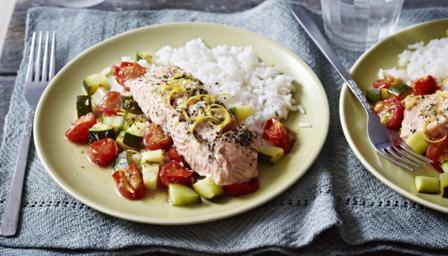 Serve the salmon with the vegetables and rice.